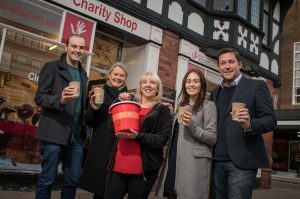 When local charity SHARE (Supporting Homeless Assisting Refugees Everywhere) approached us for some help with their marketing we couldn’t wait to get involved. 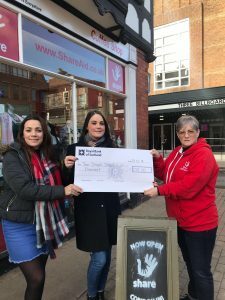 The charity was set up by Adam Dandy, Louise Edwards and Monica Hogg as a result of the overwhelming support from the local community wanting to provide aid for the current refugee crisis. The support and backing of Flintshire County Council has enabled the charity to collect donations on a large scale, from all across North Wales and the North West. Homelessness and the refugee crisis are both long term issues and this prompted the founders to become an established charity, rather than a short term provider of relief aid. As their effort gathered momentum the charity founders realised they needed a logo and an identity. Adam, one of the founders, approached Entyce’s Creative Director Jane Entwistle as she had previously designed a logo for his business Dandy’s Topsoil. The charity helps provide much needed items (clothing, shoes, sleeping bags, toiletries, food) for the local homeless population as well as relief aid (tents, blankets, sleeping bags, ponchos, clothing, toiletries, first aid kits) for refugees in Southern Europe, specifically the island of Leros and Kos at the moment. The charity is looking for donations from the public as well as volunteers to help man the centre and sort through donations. They are also keen to hear from anyone who has time to help with fundraising events and from local shops, churches, community groups who have space and are willing to become drop off points for SHARE. Information about opening times for SHARE Aid Centre for the public to drop off aid are available on the SHARE Facebook page along with a list of current needed items and contact details for people wishing to drop off or volunteer their time.